QuickStart Tennis of Central Virginia, Inc. (QCV) is pleased to report it recently received three grants totaling $13,000 for Phase Two of Bring Tennis Back to the Park! – the construction of two full-size tennis courts at Claudius Crozet Park. Bama Works Fund of the Dave Matthews Band, the Community Endowment of the Charlottesville Area Community Foundation and the Ix Foundation stepped up to support tennis in western Albemarle County. Two full-size courts will complement the three 36-foot QuickStart tennis courts for kids ages eight and under that were completed in June and provide a place for kids ages nine and over (as well as adults) to play at the Park. 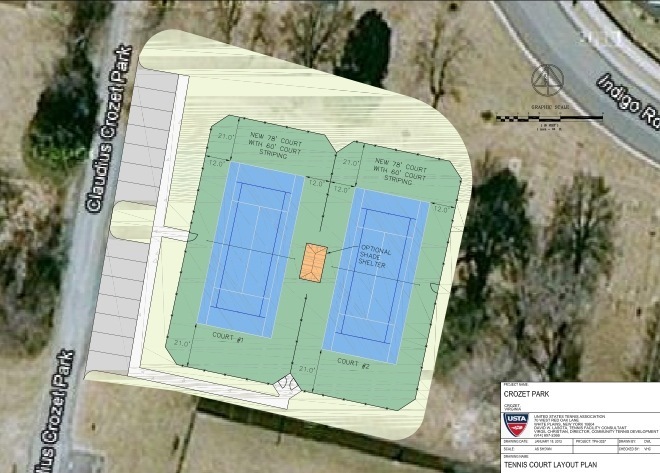 These facilities will complete the tennis pathway in Crozet. Until they get their site set up, you can donate by sending checks to QCV, PO Box 422, Ivy, VA. I think it’s interesting that no public notices signs were posted, as is seemingly the custom when changes are underway. I’m not opposed to tennis courts, just curious. No signs about tennis courts because its a park and they had tennis courts in past. The county determined it doesn’t need a special use permit since its a park and zoned for it. Tennis like swimming is a life long sport that kids can enjoy. These would be the only public tennis courts in the entire Crozet growth area. We are lucky to have the Crozet PARC there to run programming on these courts with lessons which would be accessible to all regardless of ability to pay. There’s the potential for Crozet to even have a junior tennis team down the road. The key here is in these tight economic times there still needs to be $28,000 from community to make this a reality. Some of the $80,000 raised so far are matching and will go away this spring so its important for the community to get involved to make this a reality. This is a wonderful asset to our community especially with Quick Start courts next door! Thanks for the clarification, @a7f1ae8e520551efa795e1bba39486d1:disqus Really appreciate it. Do you know if the plan for Crozet Park is anywhere online? I’d be curious to know what else they have planned. Can folks donate online to the tennis courts? Thanks for listing our Press Release. The bottom line is $28,000 still needs to be raised. If we don’t raise it by the end of April, we will lose a 1-for-2 challenge match. QuickStart Tennis of Central VA is an all-volunteer nonprofit just like the Park. Donations are tax-deductible.